The line and length of questions Eastern Cape Acting Judge President Zamani Nhlangulela asked attorney Mbulelo Jolwana during his interview made it obvious that he was a favourite for appointment to the Mthatha seat of that division — Jolwana was duly nominated by the Judicial Service Commission. When quizzing Jolwana, Nhlangulela didn’t so much over-egg his pudding as cook an omelette — but this did not appear to matter to other members of the commission, who had spent the day interviewing underwhelming, incompetent, lazy candidates for positions at the high court in one of South Africa’s poorest provinces. A province whose inhabitants require consistent and steadfast judicial protection from government and private companies. Acting as judge president because of the vacancy which was only filled earlier in the day by Judge Selby Mbenenge, Nhlangulela is the deputy judge president based at Mthatha and he didn’t so much lead Jolwana with his questions, as carry him to the Bench on his shoulders. At one point Nhlangulela asked Jolwana, “if you are ready [for appointment] as you sound to be, what promises can you give the commission” about the role he would play in the judiciary. Jolwana said he “cared about the profession” and promised to “express honest views” regarding problems in the division. Nor would he be deterred if these opinions were not taken on board, he said. A political response that gave no indication of his judicial philosophy or whether he had a transformative vision for society — a vision which he may hope to articulate through his judgments and their alignment with the Constitution. An exploration of candidates’ judicial philosophy was, in fact, completely ignored by the JSC during the round of interviews for the Eastern Cape High Court. Where other candidates were asked two-three questions by Nhlangulela, Jolwana was asked several — each designed to allow the interviewee space to wax lyrical about problems affecting the division or show off his achievements and talent. So quick were some of Jolwana’s answers that he appeared to be anticipating the questions about to be asked by Nhlangulela. Perhaps Jolwana was very well prepared. Perhaps he was a mind-reader. Perhaps he was extremely, extremely well prepared. Amidst the laughter from the JSC Jolwana gave a self-deprecating response. 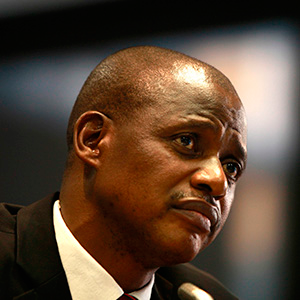 And on it went: Jolwana was asked about case flow management — a favourite topic for Chief Justice Mogoeng Mogoeng — and he expressed “surprise” and mild indignation that it had not been adopted by the Port Elizabeth and Grahamstown seats of the division. He talked about his special interest in transformation and his work at the local law society and on and on and on. On paper, Jolwana appears a hardworking and conscientious lawyer who writes clear judgments and has the obvious potential to be a good jurist. Yet, he has no experience in litigating commercial law or Constitutional law cases, among other areas of law. His entire practice appears focused on conveyancing and his acting experience is limited to a mere three months — yet the commission did not deem he required a bit more time to develop a personal sense of being a jurist through more experience. What was even more surprising during the interview was the blind eye turned to problematic matters that arose as a consequence of Nhlangulela’s line of questioning. With impunity, Nhlangulela asked Jolwana about his filling in for permanent judges who lived outside Mthatha who left early on Fridays so as to get home, rather than stay in court for the full day. “I have done that for them… so that the court system continues to function,” said Jolwana. That Nhlangulela was heading a court where judges were in obvious dereliction of duty did not appear to perturb the chief justice or the commissioners. Likewise another question by Nhlangulela which revealed that while the judge had been acting in the Eastern Cape High Court Jolwana had been keeping the Nhalngulela’s practise going. If anything, Jolwana’s interview reflected the sometimes haphazard, political and often partisan approach commissioners on the JSC sometimes adopt — which can, in the long run, have the potential to undermine the judiciary.